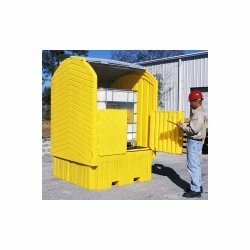 UltraTech IBC hard top spill pallet with drain. Comply with regulations while storing IBC tanks outdoors. The IBC Hard Top Spill Pallet provides spill containment for IBCs, tanks and other large containers. 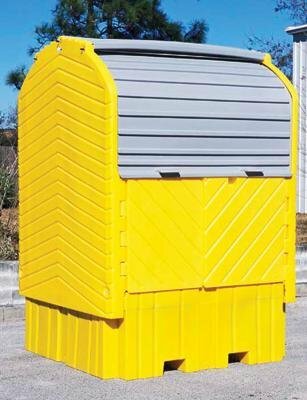 The all-polyethylene roll top unit provides both protection from unauthorized access as well as sun, rain and the elements. Simply place your IBC or tank into the unit with your forklift or other equipment, close the doors and rest easy knowing that you are protected. Eco-Smart is also used to designate products that are biodegradable, phosphorus-free, use natural materials or assist in recycling. 100 percent re-cycled content. Upper roll top door and lower swing-out doors combine to allow easy and convenient access to IBC. Safely stores an IBC tank with maximum dimensions of 52-inches by 52-inches by 61-inches. Low profile (28-inches height), 360 gallon containment sump allows safe material handling and dispensing. Forkliftable, lockable, all-polyethylene design will not rust or corrode. Helps meet new Stormwater Management Regulations - NPDES, 40 CFR 122.26. Meets EPA Container Storage Regulation 40 CFR 264.175. 8500 pounds uniformly distributed load. 360 Gallons containment capacity. Measures 64-1/2-inches length by 62-inches width by 96-inches height.